At a generous 46% ABV, it has a classic freshness with aromas of cream toffee, rich fruit and raisins. The palate is crisp and finely rounded, with the sweetness to balance an appetising dryness. Notes of tropical fruit, raisins and vanilla persist in the finish. The Welsh Whisky Company was founded in 2000 by a small group of Welsh whisky aficionados. 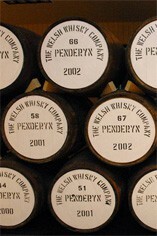 The company produces Penderyn Single Malt Welsh Whisky and a range of high quality Welsh Spirits. The Penderyn Distillery is located in the picturesque village of Penderyn in the southern reaches of the Brecon Beacons National Park. The area has spectacular mountain scenery, open moorland and valleys containing fast-flowing streams, rivers and waterfalls. The majority of the distilled malt spirit is laid down and matured in Buffalo Trace bourbon casks, and finished in rare Madeira barrels to impart a unique and distinctive character. A number of other woods, such as sherry casks, are also used for maturation, to provide a variety of specialised limited edition whiskies to be released from time to time. All distillation, maturation and (unusually) bottling are carried out on the company's premises; enabling close quality control to be applied to all stages of the process. 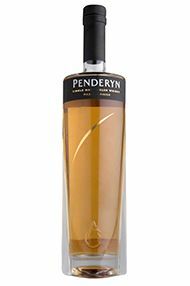 Penderyn Single Malt Welsh Whisky was first launched on St David's Day, 1st March 2004, in the presence of HRH Prince Charles.